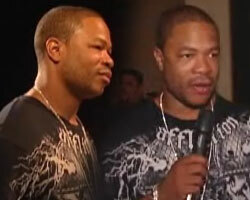 West Coast rapper Xzibit has come a long way since he began in the early 90s running around with the Alkaholiks. But as his career took off, one thing was constant, his long braided hair. The rapper was recently spotted at Sacramento Kings owner Gavin Maloof’s housewarming party in Las Vegas and he was looking very different — completely shaven and a buzzed head. It’s one of the rare times in his over 10 year career that he has been seen without his trademark braids (see photo). The 33-year-old Xzibit (real name: Alvin Nathaniel Joiner) began his career as a member of Tha Alkaholiks’ Likwit Crew. In 1995, he inked a deal with Loud Records in which he released his debut album, At the Speed of Life, the next year in 1996. He went on to release five more albums — 1998’s 40 Dayz & 40 Nightz, 2000’s platinum certified Restless, 2002’s Man Vs. Machine, 2004’s Weapons of Mass Destruction and 2006’s Full Circle. After all the years, X has a new look.